Santa's delivered all the presents and now he's adding some treats to the Christmas tree. Won't the children be surprised! This festive scene is stitched with cotton thread on 16 count dove grey Aida. Kit includes fabric, thread, wool yarn, sequins, color-coded thread sorter, felt for the stocking back, and an alphabet for personalizing. Kit contains wool yarn, cotton thread, 16 count dove grey Ai..
Have you been good this year? The red-robed gent is checking his list twice to make sure that you have been so he can deliver goodies from his sack full of toys! This charming holiday portrait is worked with cotton threads on 14 count white Aida and includes everything you need for personalizing and wool yarn to make the braided hanger. Kit contains cotton thread, wool yarn, 14 count white Aida, f..
Come join the merriment as you stitch this adorable Christmas stocking. Bright shades of cotton thread are worked on 14 count white Aida in an artistic blend of Cross and Half Cross Stitch. Any child is sure to be charmed by these sweet characters. Kit contains wool yarn, cotton thread, 14 count white Aida, felt, needle, and easy instructions with an alphabet. Finished Size: Approx. 16" Long (41 c.. Dressed in his brightest and best holiday sweater, cap, and scarf, a jolly snowman delights in the delicate snowflakes swirling around him. Stitch our needlepoint Happy Snowman Stocking for yourself or as a Christmas gift. Finished Size: 16" Long (41 cm). Kit contains pre-sorted wool yarn and cotton thread, full-color print on 14 mesh cotton canvas, felt, needle, and easy instructions with an alph..
Looks like Santa even has a present for this affable snowman on Holiday Glow Stocking. This counted cross stitch design from The Gold Collection by Dimensions features beautiful shading and realistic detail. Finished size: 16" long. Designed by Hazel Lincoln. Illustrated by Hazel Lincoln. Courtesy of www.image-source.co.uk. Kit contains presorted thread, 18 count white Aida, felt, needle, 100% wo..
Three cheers for this trio of whimsical owls! They're ready to celebrate the Christmas season with you. The fun and festive Holiday Hooties Stocking by Dimensions is worked in counted cross stitch. Finished size: 16" long. Designed by Julie Dobson Miner. © Julie Dobson Miner / Artworks! Licensing. Kit contains presorted thread, 14 count light blue Aida, felt, needle, 100% wool yarn for hanger, an.. Welcome this trio of penguins into your home this Christmas season. The delightful Holiday Penguins Stocking by Dimensions is stitched predominantly in yarn and will appeal to the young and the young at heart. Finished size: 16" long. © Victoria Hutto / SCCS, Inc. Kit contains presorted wool and acrylic yarn, cotton thread, 12 mesh canvas printed in full color, felt, needle, and complete instructi..
A beautifully detailed manger scene is depicted in our Holy Night Stocking. This counted cross stitch design is sure to be a treasured heirloom. Finished Size: 16" Long (41 cm). Kit contains pre-sorted wool yarn, cotton thread, and metallic thread, 18 count ivory cotton Aida, felt, needle, and easy instructions with an alphabet. Designer: Richard Jesse Watson. © Richard Jesse Watson. By arran..
Our adorable Hugging Penguins Stocking is ready to spend the holidays with you! This delightful needlepoint stocking stitches up quickly using a combination of wool yarn and cotton thread. Finished Size: 16" Long (41 cm). Kit contains pre-sorted wool yarn and cotton thread, full-color print on 12 mesh cotton canvas, felt, needle, and easy instructions with an alphabet. Designer: Makiko. Illustrati..
Icons of winter fun are the centerpiece of this Ice Skates Stocking from Dimensions. 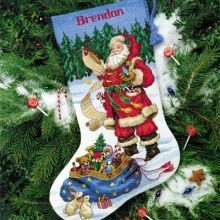 With its winter sky and beribboned greens, you'll have a beautiful needlepoint stocking for a teen or adult. Kit features classic designs and high quality materials. Includes full color printed 14-mesh cotton canvas, stitching fibers, needle, felt for backing, alphabet for personalization and complete instructions..
An unlikely trio of friends has joined together to celebrate the holidays with you! The delightful Jolly Trio Stocking by Dimensions is worked in counted cross stitch. Finished size: 16" long. Designed by Stacey Yacula. © Stacey Yacula. Courtesy of MHS Licensing. Counted cross stitch kit includes: • Presorted cotton thread • 100% wool yarn for stocking hanger • 14 count white Aida • Felt • Needle .. This delightful stocking is a perfect reminder that Santa is watching. This design uses Cross and Half Cross Stitch to create wonderful detail and shading. Kit includes 14 count white Aida, cotton thread, needles, yarn for hanger, felt for stocking back, instructions, and alphabet for personalizing. -- Finished Size: 16" long (41 cm) -- Designed by: Bradley Clark / © Bradley Clark. Licensed by Suz..